In addition to our full range of business services, Penn Jersey is a proud Ceiling Pro practitioner. We offer ceiling cleaning services to Universities, as well as colleges, schools and other educational establishments. Our University Ceiling Cleaning services ensure that your premises will always be hygienically clean, ensuring public health is not compromised. Premises that have a high customer footfall need to be kept clean and safe at all times and to the highest standard possible. A safe, clean environment for students and teachers will ensure a solid first impression and provide a safe and healthy place to study and work. University Ceiling Cleaning Services are undertaken by Penn Jersey as a Ceiling Pro practitioner. These services can be used for many different types of ceiling. They will remove any requirements for further painting, decorating or ceiling tile replacement over time. Sometimes a simple clean is all that is required to make university ceilings safe and hygienic once more. Penn Jersey and Ceiling Pro’s specialist cleaning process will make sure surfaces are sanitized and hygienic. This is particularly important when considering acoustical and textured ceiling and ceiling tiles. Value for Money: Don’t replace or paint over existing tiles. Professional university ceiling cleaning is an effective and affordable solution. Keep Acoustical Tiles Sound: Acoustical ceilings are designed in such a way to absorb sound. However, this will be compromised if you paint over them. Careful cleaning will help keep them in perfect condition. Keep Fire Safety in mind: Keeping University premises fire safe is a key concern. Painting over ceiling tiles can adversely affect this. 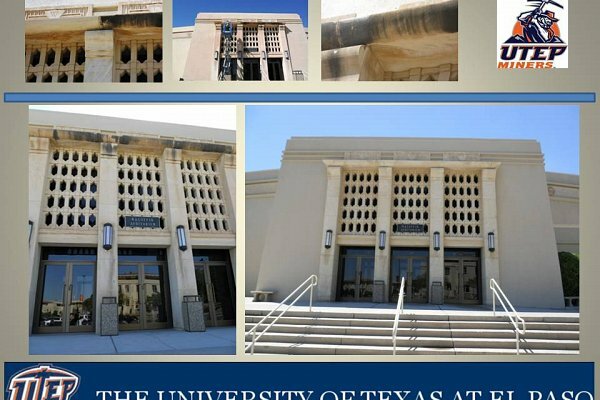 Our University Ceiling Cleaning system will not affect fire resistance. Lighter surroundings: Your University will look and feel brighter with a properly cleaned and maintained ceiling. Our University Ceiling Cleaning process if energy conscious and cost effective. You won’t need to add in extra lighting. Sanitized, deodorized and hygienic Universities are healthier: Your university ceiling will be cleaner, hygienic and provide a much nicer environment for students and teachers. Whatever stain needs removing, our University Ceiling Cleaning process will return it to like-new in appearance. The busy nature of each semester at any university means cleaning needs to be efficient and cause as little disruption as possible. Our expert cleaning teams can work overnight, alternating shifts or even over the summer when most classes are finished for the year. We work to effectively and efficiently complete each university ceiling cleaning job in as fast a time as possible. This is while also ensuring the highest levels of cleaning and a brighter, more hygienic environment for your students and staff. Trustworthy Fire Resistance: if you clean your tiled ceiling rather than paint it, its fire resistance is fully maintained. Boosted Luminosity: a bright and clean environment for your students and staff is guaranteed with Ceiling Pro cleaned ceilings. You can remove the need for additional lighting, adding an energy efficient benefit. All Stains, Odors and Grime: from nicotine to grease, all stains, dirt and damage is quickly erased from your ceiling. Whatever is causing any discoloring or unpleasant odors will quickly be eliminated. Penn Jersey have worked with all manner of ceilings, sometimes in extremely unsanitary conditions and have always restored them to their former glory. Our experienced, well-trained, insured and bonded crews work extremely hard to provide a solid, speedy and professional service on your University premises. Furthermore we will not disrupt or inconvenience your educational establishment as we carry out our work. Our professional teams are ready and waiting to get started. We are always ready to take on new challenges and look forward to hearing from you soon and discussing our university ceiling cleaning services with you.